California Dance Academy's production is a bridge between Christensen's first Nutcracker and contemporary times. Jennifer and Robbin Shahani, directors of the studio, danced in The Nutcracker under Christensen at Ballet West in Utah. They bring a beautifully choreographed performance of the ballet which is both rooted in Nutcracker history and which incorporates new interpretations of the rich and varied source material. California Dance Academy and Dance Ensemble combines academy students, pre-professional dancers, and professional guest dancers into an entertaining cast which is as diverse as the San Fernando Valley community that California Dance Academy calls home. 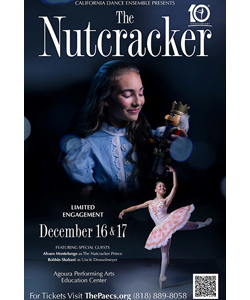 Attendees will experience a professional ballet with a storytelling choreography that is engaging and inviting to audiences of all ages and levels of familiarity with The Nutcracker. 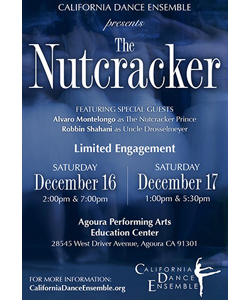 Come and see California Dance Academy and Dance Ensemble perform their version of The Nutcracker in a beautiful setting.